Adventures With The Animal Family | PROOF OF GOD! ...and other tragedies. The hamster just died yesterday, of old, old age. I didn’t want my hedgehog to die. I like Hildie. She is fascinating and sort of sad because she never asked to be interesting. She just wants to live in dark places and eat bugs. I felt awful about her relatively small (i.e. smaller than southern Africa,) frequently bug-less habitat. I had to save her. She wouldn’t even un-ball. It was like she was drugged into a defensive sleep. Maybe she was just cold. Maybe she was dehydrated. She must be dehydrated. She’d been balled up for two days. I wondered if we had any saline. Sometimes the kid’s dad had some he’d left in his work scrubs and we’d just toss it into the bathroom. However, I was pretty sure I had used it to flush an abcessed wound on Little the Cat’s leg a couple month’s ago. And what would I do if I did have saline? A sub-dermal injection? 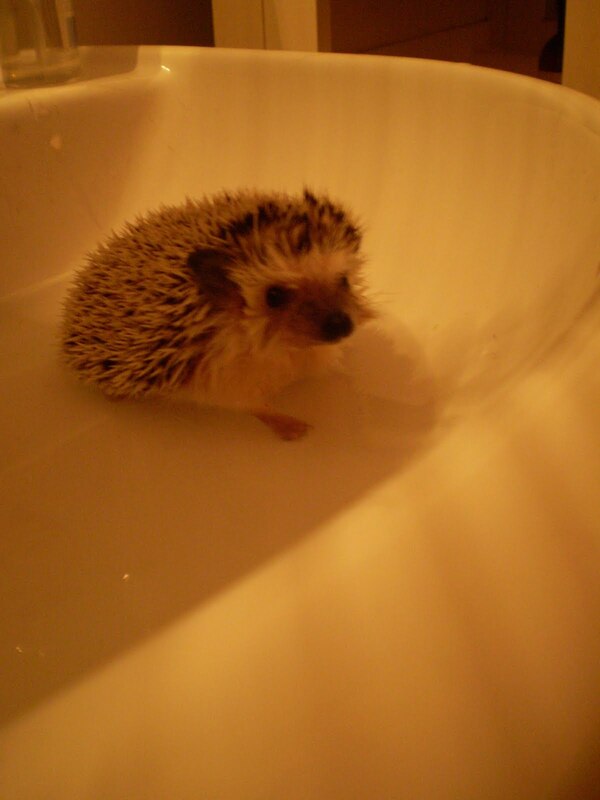 How do you inject a hedgehog that won’t come unballed? It was horrible idea. Harsh and medical. And, let me remind myself, I am not a veterinarian. But, I do know how to do sub-dermal injections of saline. Little the Cat almost died a couple of years ago (I suspect a wicked chartreuse fungus that I later found in a houseplant, complete with bite marks distinctly feline) In the euthanasia room, I begged the vet to just let me take him home. She instructed me to re-hydrate him by sub-dermal injection. Showed me how to do it. I only had to do it once. He was fine in a couple days. A bit more odd having lost at least one life, but fine. 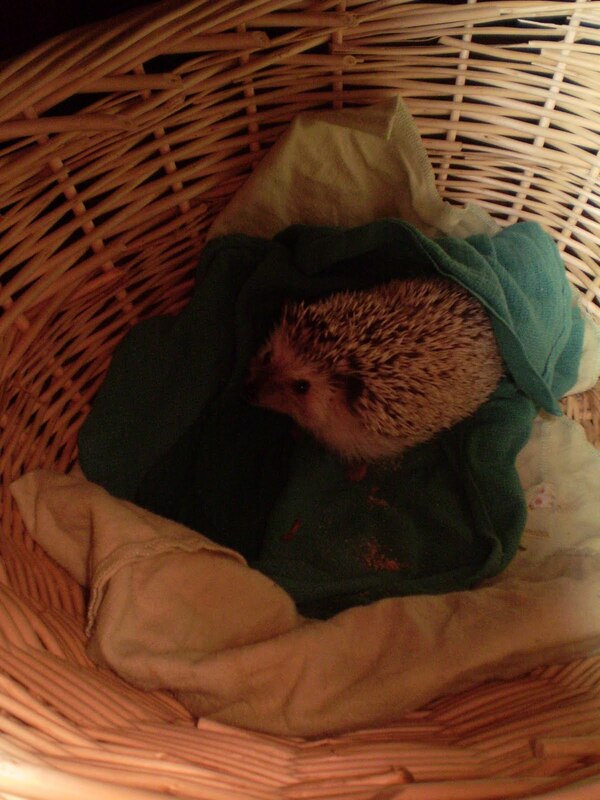 Back to the hedgehog, Hildie. She smelled sort of sour. Like an old person left unturned. She placed the ball in the water. It rolled slightly. She poured water over the ball with her hands. It bristled. She rolled it around a little. Dripped water on what she thought must be it’s head. Rolled the ball face down and, hello hedgehog. She was tired. I could tell. She began to rouse herself though and seemed to enjoy being rinsed off. She peeked out of her towel, bright eyed and promptly ate four mealworms. Even if she does have swine flu, the warm bath seemed to help. And what a fun thing to do on a Saturday night. These are stories I want to tell. Remember: Christian Commune that organized railroad lie-downs when the trains would come to Kings Bay. The house my father built. Rach’s house. Also – my life in cats and dogs. Animal Families. Oh, Dang – I forgot. Already. That the geriatric hamster that refused to die actually did, finally die. In a small heap by her water bottle. She was about three years old. Which is pretty darn old for a hamster. It was time. Except it was not. Meaning it was bad timing, horrible timing. Meaning it was 6:15 in the morning and Olive was already distraught about getting dressed and eating breakfast and her mom wanting desperately to take a shower. Just so she could be alone. A lovely and efficient pre-sunrise burial promptly ensued. Hurried tales of golden wheels and hamster spirits making wind. In a fit of being the mother of Olive’s dreams, I promised we could get new hamsters. I delegated this animal procurement to the children’s father. In part because I wanted to take a nap and in part because I am trying to be generous in sharing delightful experiences with Leo and Olive. How fun is going to buy hamsters? In my mind, extremely. They will be here momentarily. 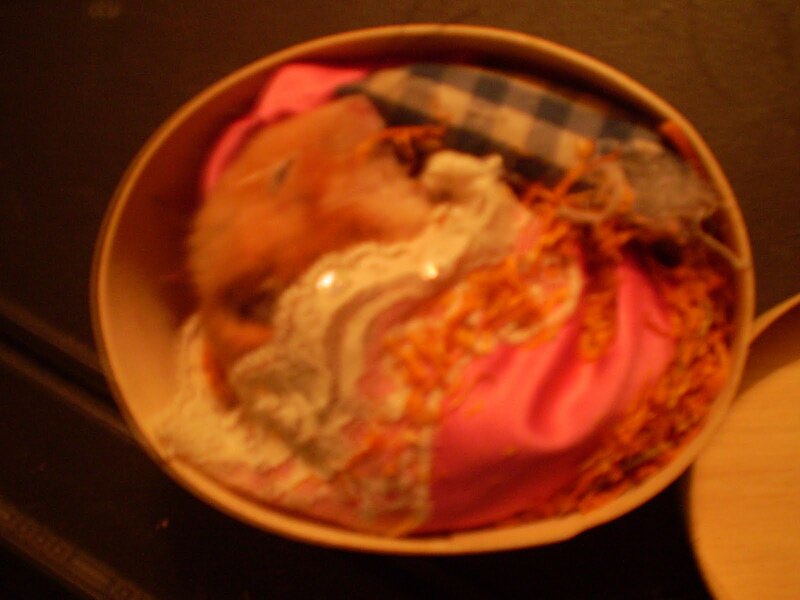 I knew it was a little morbid to take a picture of the deceased Hammy in her burial vessel. But, I wanted to remember that I took the time to wrap her in satin trimmed with sequined lace. That I made her a pillow filled with timothy hay and dried marigold petals. That Olive tucked a cat-toy mouse in beside her. It was a remarkably lovely ceremony in spite of the pre-dawn hours. 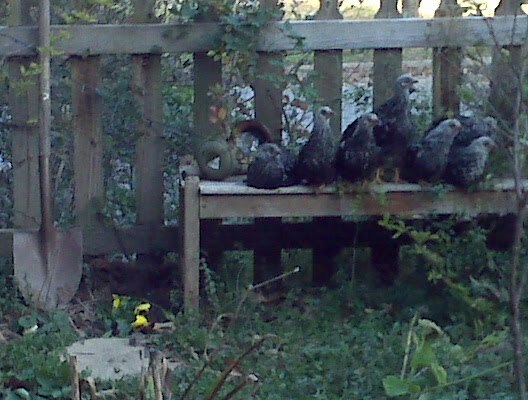 Here is a cellphone picture of my chicken ladies, roosting on the garden bench late in the afternoon. The yellow pansy beside them marks Hammy’s final resting place. The chicken ladies are such a nice addition to our animal family. Under the scrappy terrier mix is very protective of them. The cats have expressed little more than momentary interest. I can see calculations of edibility in their feline eyes. The ladies are just too big and too collective to bother with. It is fascinating to me that the ladies are 8 individual animals that often move as one. I have a flock in my yard.